Out-of-work Ploughboys dance a slow heavy step in a strict and particular fashion and demand money with menaces. In 2017 we were graced with the presence of The Seven Champions, that was spectacular in itself, but for 2019 we have managed to procure the ‘services’ of Old Glory Molly. We can’t wait. Plough Monday (the first Monday after twelfth night or Epiphany) is historically the day which marked the end of the Christmas period for the agricultural communities in the eastern counties of England. 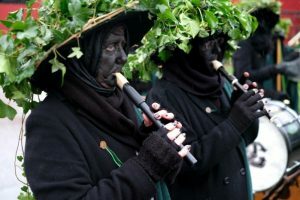 It was an occasion for plough gangs, who would be disguised, usually by blacking their faces, to procure money or largess by dragging a decorated plough around the larger houses in the parish, with the cry of “Penny for the ploughboys!”. It was said that if you did not contribute even one penny, you would find a furrow ploughed across your lawn in the morning. Before the Reformation, the Church sanctioned the collection of money, some of which went toward providing the plough-light, maintained by the ploughmen’s guild in the parish church. This usually took the form of a candle or rush-light, placed before the altar, whose flame was never allowed to go out. There would also be gangs of Molly dancers, sometimes accompanying the plough gangs. 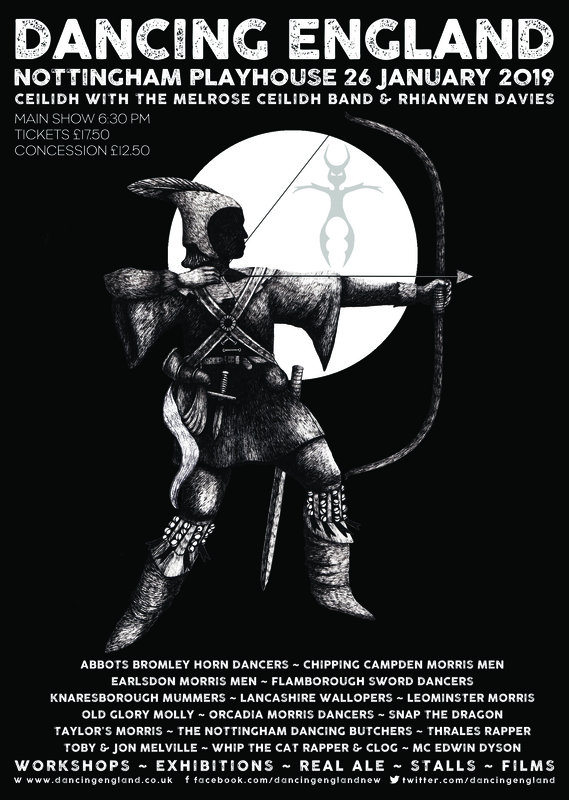 Old Glory was formed in 1994 to revive the tradition of Molly dancing in East Suffolk. 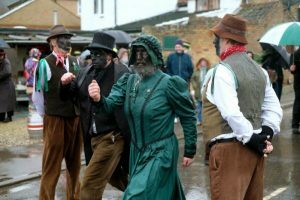 Molly dancing traditionally only appeared during the depths of winter and is regarded by many people as the East Anglian form of Morris. It is characterized by blackened faces, heavy boots (usually hobnailed) and the presence of a “Lord” and a “Lady”, two of the men specially attired respectively as a gentleman and his consort, who lead the dances. There are other characters in Old Glory, such as the “umbrella-man”, who acts as announcer, a “box-man” carrying a collecting box, the “broom-man”, who clears the way for the dancers, and the “whiffler”, whose job it is to marshal the dancers. Blackening faces was a form of disguise, since the dancers could not afford to be recognised. Some of those people from whom they had demanded money with menaces would have been their employers. Molly dancing is by nature robust and, some would say, aggressive. These qualities are emphasised by the sound of the hobnailed boots worn by the dancers, which were the normal form of footwear for farm workers in the East of England right up until the second half of the twentieth century. You can catch some of their performances on YouTube, but we’ve added one for you below. Tickets as ever – https://www.nottinghamplayhouse.co.uk/whats-on/dance/dancing-england/ or from the Box Office on 0115 941 9419. Be the first to comment on "Gosh. Performing for you at Dancing England – Old Glory Molly"